The Port Phillip and Westernport CMA were honoured to be present last week (Tuesday 9th October 2018) when the Hon. 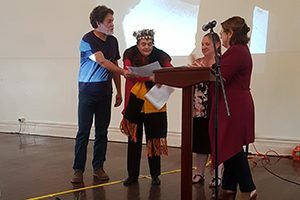 Natalie Hutchins MP, Minister for Aboriginal Affairs, formally handed over the title of three Galeena Beek properties in Healseville to the Wurundjeri people. Galeena Beek was built at the historic Corranderrk site and ran as a cultural centre where the Indigenous population could meet, celebrate their culture, display artwork and engage with the community. Unfortunately, in the late 1990’s Galeena Beek was closed down. From this point, several businesses have operated out of the site, including an art gallery, wedding reception and restaurant. These businesses were ultimately unsuccessful and the property was then abandoned. The property has now been unoccupied for approximately 10 years, with the title being retained by the government. After many years of campaigning, with the support of many local organisations, the Wurundjeri Council has been successful in obtaining the title The Wurundjeri Council and community have hopes to return the building to its original intended purpose – a cultural centre.